So, my journey begins, starting with a prototype magnetic loop assembly. A starting point for what’s to come, and maybe even part of my finished product. You are right. It does look like an orange version of the wonderful Wellbrook 1530 loop, which is my inspiration. My intention is to learn enough to understand how wideband magnetic loops work. My end game is to design a working system and build it up. This will take a lot longer than simply buying the Wellbrook but, for me, I hope time well spent. My prototype magnetic loop assembly shown above is at once simple and powerful. Simple in the sense of just being one turn of half-inch PEX-AL-PEX with a one meter diameter. Powerful in the sense that it provides me with some hardware to support my learning and experimentation. As I have described previously, the aluminum core PEX contains a thin conductor inside lightweight plastic. PEX is easy to form into a loop and holds its shape without much help. By pure coincidence, I had some orange PETG filament which I used to print my loop base and amplifier box, as well as a top brace. If you are going to try this approach, learn how to CAD a curved tube inside a plastic block. By curving the holder for the loop to the same radius you get a much better fit. Finally. I added a vertical brace of half inch PVC pipe to give additional support and reduce the twisting forces on the base holder. 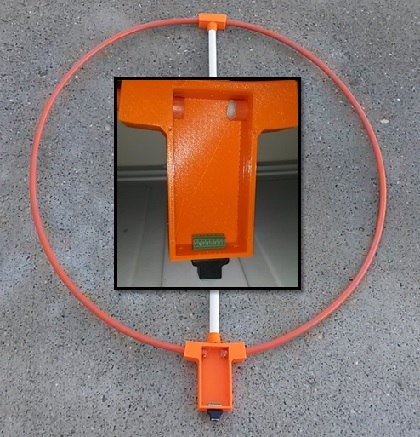 This entire prototype magnetic loop assembly weights less than 1.5 pounds and has wind loading of under 0.5 square foot. In the past, most folks who built receiving loop antennas used coaxial cable and piggybacked power through the cable. The trend today is to use Ethernet network cable instead. What are the differences? If properly applied, CAT should reduce common mode interference along the transmission line. It also contains multiple twisted pairs (4) allowing you to send power, control and RF signals separately. Finally, impedance is 100 ohms of balanced line, rather than 50 ohms unbalanced. As you can see in the prototype magnetic loop assembly, I have used RJ45 screw terminal blocks embedded in the plastic box to enable screw connections without the challenge of wiring tiny RJ45 connectors.